Disclosure: This post was created in partnership with SUSU Handbags and eAccountable. All opinions are my own. I used to be afraid to wear all black, worrying that I would look like I was attending a funeral or was in some deep dark depression. 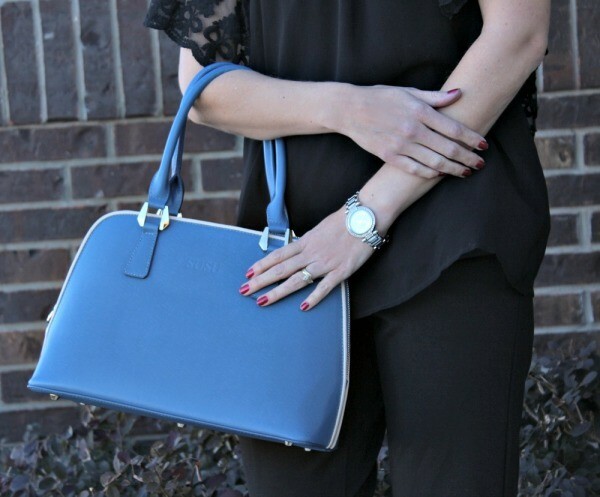 But there’s something to be said about wearing this color from head to toe – it’s slimming, it’s classy and it’s so much fun to add a pop of color from an accessory, which I did with my blue Melissa handbag from SUSU. Have you ever owned a handbag that you love so much you just can’t stand it? No? Just me? I tend to switch up bags a lot throughout the week because I get tired of one quickly. My SUSU Handbag has been with me a week and I’m still not ready to part with her. 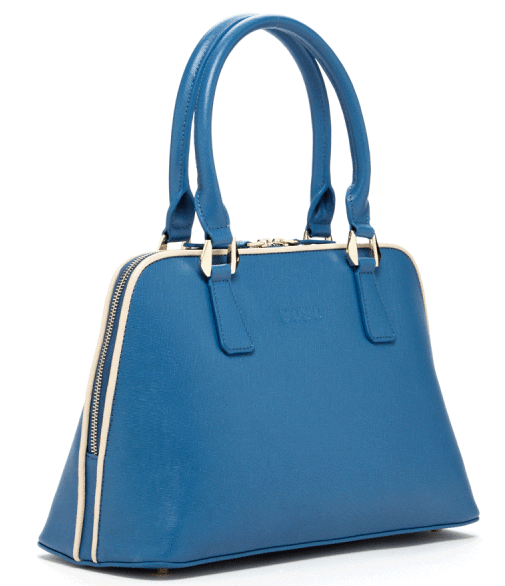 This is the Melissa – Saffiano Leather Dome Satchel in London Blue. It features a top zipper closure, inside cotton lining, two interior cell phone pockets, a zipper pouch and comes with an optional cross body strap. 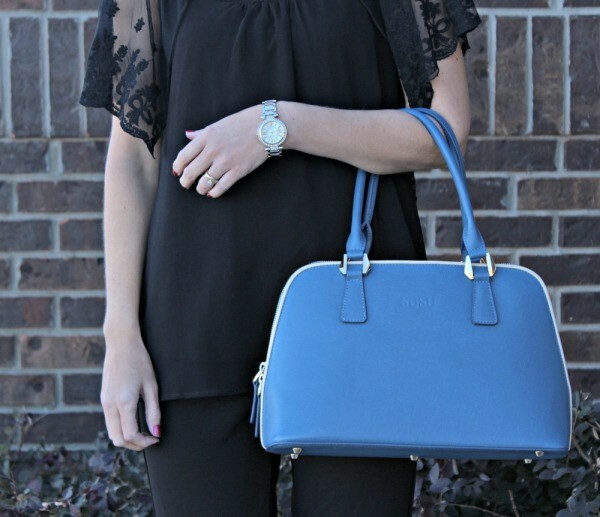 The blue is actually quite a versatile color and the handbag can be used as an everyday bag or for a special occasion when you need a quality handbag in a brilliant color. I’ve been using this as my everyday bag and I am so pleased with it. If you need a quality gift idea for that special woman in your life, this is it. 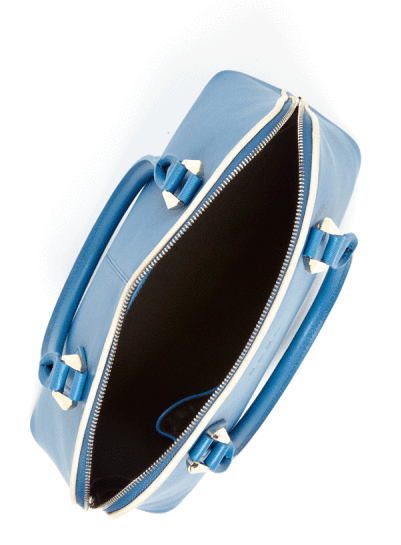 If you need a high quality handbag that will last you for years to come, this is it. And, if you want to gift yourself something, just because, THIS is it. Speaking of gift ideas, SUSU is running a Black Friday Special where they are offering 40% off and Free Shipping on any order with code BLACKFRIDAY. That is a great deal, so be sure to visit their website to take a look at their selection and save 40% on November 28th only. 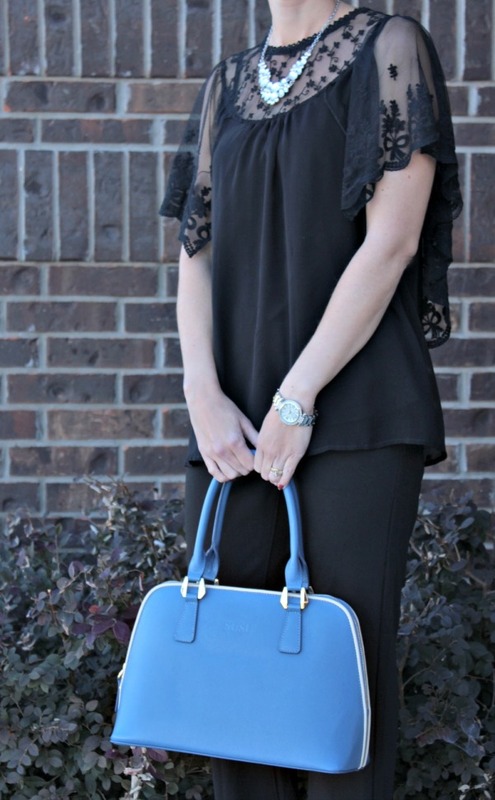 About that giveaway….SUSU is giving one lucky winner a handbag of their choice, up to $695. Enter via the form below and good luck! Giveaway ends December 31, 2014. Previous articleBlack Friday Shoe Sales at Rack Room Shoes, Plus an Amazing Holiday Getaway Sweepstakes! Since my name is Jodi, I’d choose the Jody in black/leopard. I’d get the brown Ava Leather Bucket bag. I love the look of the Jody – Two Tone Black Leather Tote Red Shoulder Bag. I would pick the Chloe -Leather Satchel Grey. I like the Melissa – Saffiano Leather Satchel Dome Tote Lime . Happy New Year!! I would choose the Crosby-Leather Purse Camel Crossbody.